There are many reasons why you’d want to get the best reloading press. You may want to do it as a hobby, for long-term savings on ammunition, or simply for the satisfaction of knowing what is in your customized ammo. If you didn’t know, ammunition manufacturers make more than $13.5 billion in annual revenue with profits of over $1.15 billion. Keep in mind that there are millions of firearm users who need a constant supply of ammo at all times. It’s a good thing that you don’t necessarily have to buy your ammo supply from a local gun store when you can make your own at home. This is done in a process known as reloading. Whether you are a professional hunter or an avid shooter, you can create an exciting ammo making hobby and save money in the long run. 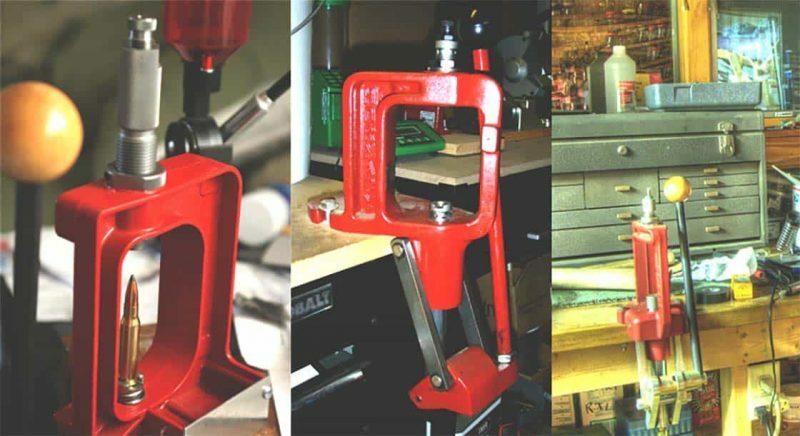 All you need is the best reloading press at home. What is a Reloading Press? Why You Should Have a Reloading Press? What are the Different Types of Reloading Press? Why the Lee Precision Breech Lock Challenger Press is the Best product for Beginners? A reloading press is basically a piece of hardware equipment used for assembling gun cartridges at home. It saves you money spent on buying ammo. To assemble your own gun cartridges using a reloading press at home, you’ll need a bullet, primer, casing, and gunpowder. The press has an easy to use lever that can compact the materials into usable ammunition. It is easy to use the piece of equipment with high ammo productivity. Once you get the hang of it, you can produce more than 400 bullets in an hour. It comes with all the necessary parts and accessories to run the entire process by itself. You can also use the progressive reloading press or other purposes such as measuring gunpowder and deburring. There are many benefits of investing in your own reloading press. For instance, consider the issue of ammunition costs. It is much cheaper to assemble your own ammo than buying factory made bullets. You can save as much as 50% on centerfire rounds such as the 9mm Luger. It will cost you around $20 to buy one hundred rounds of factory made 9mm Luger while you can easily reload the same bullets at home at a cost of just $7 or less. When it comes to cost, reloading is far much cheaper than buying bullets from the local gun store. There is also the issue of performance. While factory made bullets are perfect, and always work fine, they cannot be relied on when you want to accurately gauge the performance of your gun. Reloading your own bullets is the best way to accurately measure and improve your gun’s performance, especially if you have a rifle. A majority of sharpshooters actually load their own bullets for excellent performance. With a reloading press, you can know the quality of bullets you use since you made them yourself throughout the entire priming to crimping process. A reloader has the luxury of choosing parts and ingredients to use while assembling bullets. You choose your own primer tools, bullets, and the specific powder measure for each bullet. The reloading press equipment comes with detailed manuals and guides that show you the right measurements of powder and other necessary adjustments. There are three main types of reloading press equipment, the single stage press, the turret press, and the progressive reloading press. Let’s take a look at each type of reloading press as well as its features and benefits. The Single Stage Reloading Press is the most basic reloading machine and is highly recommended for beginners in this field. Has a straightforward process that is perfect for a reloading beginner. It is a rather slow press with a production capacity of 100 ammunition per hour. However, it gives you a precise reloading process and high-quality ammo production. It is easier to set up with fewer adjustments than the turret or progressive reloading press types. Also happens to be the cheapest compared to the other three. Here are the top three Single Stage Reloading Press Products on the market today. This is the best single stage reloading press for those who want to produce precision rounds. One of its greatest advantages over other presses is the fact that it operates from a bench top. Its case is completely immobile and the die is designed to come down on the case easily. It is a sturdy durable press with all-steel linkage and a strong cast iron frame. This is a machine with all the stability and ruggedness you seek for in the best reloading press for accuracy. It comes in an ambidextrous design that allows you to change the dies fast and easy access to your bullet cases whether you are left or right handed. Accurate reloading press. The most accurate single stage reloading press is made of strong durable materials. Is a top quality product from Bushnell. Comfortable reloading. Has an ambidextrous handle operation that ensures allows easy and comfortable reloading for both right and left-handed users. You can place the lever on the left or right side of the machine. Sturdy press. It comes with a large 2-inch diameter ram. The size of the ram determines how sturdy a press is. A wider ram works better than a smaller one. Big opening frame. The machine has a large opening frame measuring 4.5 inches. This is large enough to help you resize and seat bullets on a wide range of brass, which may be longer than the common ammo you regularly use. Longer brass can still work on this reloading press. You can use it comfortably on top of a stable bench. This is another single stage reloading press that’s ideal for beginners and reloaders who want precision and full control in the process. It gives you great precision and reliability thanks to its solid cast frame that comes in a unique angle. The angle is designed to give you direct visibility and access to the cartridges. The Lock-N-Load is designed for perfect die and shell holder placement. It has a quick change bushing system that ensures the entire process is fast and easy. Fast bushing system. Has a quick change bushing system that allows you to easily change from one die to a different one in seconds. Easy setup system. All you need to do is set the die and tighten the ring on to the bushing. The huge amount of leverage. Comes with Power-Pac Linkage complete with Solid Steel Arms that can rotate on its steel pins. The linkage design increases the amount of leverage you place on the handle to make things easier and less energy demanding. Self-aligning primer. Has a Positive Priming System which is a self-aligning primer that allows easy manual operation. Easy-grip handle. Comes with a large easy-grip handle with a ball style grip to reduce fatigue, increase leverage, and reduce effort. The company RCBS is known for manufacturing durable, effective, and high-quality reloading equipment. The Supreme Press is a perfect example of the company’s high-quality products. It is an O-frame benchrest reloading press made of sturdy cast iron for accuracy and durability. This new model has a longer design to accommodate larger cartridges and fast loading. It has a large ambidextrous lever and a comfortable ball handle for easy handling. The strong, versatile, and reliable Rock Chucker Supreme Press is designed for both beginner and advanced users. If you are looking for bench-level accuracy or are thinking of changing brass to make wildcat rounds, then this is the best single stage press for you. Has a higher price tag but delivers value for money. The turret reloading press is an improved version of the single stage press. It is designed for users who want larger batches of ammo at a lesser cost. The machine normally takes one cartridge at a go and comes with four or five die stations. A beginner with a little experience can also use the turret press for faster results. An experienced reloader, on the other hand, can produce as many as 200 rounds per hour using this reloading press. The turret press is so named because of its revolving turret located at the top. The revolving turret allows the user to process multiple dies at once. The press is also ideal for assembling caliber rounds because of its easy hassle free set up. It allows the reloader to use more than one turret set up for every cartridge being loaded. It is a great time saver. Some of the major benefits of this type of reloading press include a quicker production rate, easy changing of caliber, and a revolving removable turret. It also includes a scale for powder and a handy case length gauge. On the downside, beginners will find its multiple moving parts a bit confusing. It is also more expensive than most single stage reloading press products. Let’s now look at the best three turret reloading press products available on the market today. This Lee Precision Classic Turret Press Kit is actually a full set of Lee dies to get you started in reloading instantly. It is a full set of Classic turret press designed to give you quick and convenient loading of handgun cartridges. It has a high production rate of more than 250 rounds an hour. Included in the kit is a useful Pro Auto Drum powder measure complete with a rinser for small rifle and handgun cartridges. It also comes with a small and large Primer to give you an easier time. Another great thing about this kit is its immediate change turret which allows easy and faster changing of calibers. Case conditioning tools. This includes Lock Stud, Cutter, Chamfer Tool, Lee case sizing lube in a tube, and Primer Pocket Cleaner. Provides a perfect finish on projectiles too. The lever has a round wooden ball that starts feeling uncomfortable after you do more than 100 rounds but overall it is an efficient turret press. The T-Mag Turret Press is designed to provide unmatched precision, power, and versatility in reloading. Has a Hi-Tech frame complete with a silver hammer tone powder coating for extended durability. It also provides the easiest and smoothest indexing thanks to its improved turret handle, with a 6-station turret head that allows you to load six different dies at once. The turret head can be detached to allow you to change calibers on the fly while maintaining your precise setup. What’s more, the turret handle can also be used as a wrench when you want to remove the turret. You don’t need any other additional tools to detach the turret. The handle is also ambidextrous for both right-handed and left-handed users. It is an upgraded turret press designed for greater stability and versatility. This is a heavy-duty Lee Precision Classic turret available in red color. It is a great option for users who make reloading ammo regularly. It is a great tool for both beginners and advanced reloaders. What sets it apart from the rest is its sturdy, cast iron built-in. It features a smooth lever with a well- polished hardwood finish. It is an all-in-one press that comes with everything you need to begin reloading immediately including die sets and cartridges. The Lee Precision Classic Turret Press can produce over 250 rounds an hour. It also comes with a Pro Auto Drum powder measure and a large and small Primer. Removable turret. You can change its removable turret when you want to change calibers. Its wooden ball handle becomes uncomfortable after you produce more than 100 rounds but overall it is easy to use. A progressive reloading press works like a domestic ammo factory. It provides you with a big number of bullets at a cheaper cost than what you’d pay at a gun store. The progressive reloading press has an almost automatic process where the only thing you do is install and adjust the dies. It is an ideal option for shooters who need to reload high volumes of ammo at a faster rate of up to 500 rounds every hour. Progressive presses have 4 or 5 die stations, powder measures, specialty dies, and other accessories. They are designed to produce large batches of ammunition at a faster rate than the single stage and turret presses. Once the press is set up, it keeps on cranking out rounds non-stop. The progressive reloading press works in a rather advanced way which might pose problems for a beginner with limited reloading experience. However, it is the most efficient type of reloading press compared to the other two types discussed above. It also happens to be the most expensive of the three types. The Hornady Lock-N-Load progressive press is a fully automatic 5-station reloading press with innovative features and functions. It is designed to give you smooth, fast, and precise progressive reloading experience. It comes with the Lock-N-Load fast change technology, a 5-station die platform, auto indexing, and a reliable cartridge ejection system known as the EZ-Ject. The press can easily load both handgun and rifle cartridges. Quick Change Lock-N-Load system. This allows you to change over from 223 to 45 in as little as 5 minutes. Built-in priming system. This makes priming very easy. Universal case retainer. It comes with a universal case retainer spring that allows you to insert or remove a case anytime during the loading process. This quality and sturdy Dillon reloading press is a reliable piece of reloading equipment designed to give you years of service. It is the monster of progressive reloading with a lot of useful features and other additions. 5-station progressive reloading press. This is capable of giving you an accurate ammo reloading process in the quickest way possible. The stations follow a 5-step process. In the first step, brass is resized as depriming takes place. The second step places the new primer and chooses the correct measure of powder. The 3rd station does the powder check while the fourth station and fifth stations assemble and eject the bullet respectively. Auto-indexing press. Auto-indexing allows the press to operate on multiple stations every time you pull the lever. Removable tool head. This makes for an easy set of specific dies. This helps to save time during the reloading process. The Lee Precision Load Master comes with a large ram with a diameter of 1 ¾ inch and ample stroke clearance that can accommodate the largest magnum rifle cases. The machine can work as an auto-index progress press. It has 5 stations that can accept a majority of popular dies. It reloads both handgun and rifle cartridges with great ease and precision. 5-station reloading press. Very useful for fast reloading. Carbide 3 die set. Comes with carbide 3 die set, turret, case feeder, shell plate powder measure, and primer feeder. Can reload both rifle and handgun cartridges. Durable materials. Made of durable cast aluminum. Auto progressive reloading press. This helps for greater precision. The company recommends using CCI or Remington primers only. However, if you want to use any other brand of primers, you can install the explosion shield that is included in the package. Now before we unveil our best beginner reloading press, it is important to first point out a few things you need to consider when you start reloading. As a beginner, the first thing you need to do is decide which type of reloading press is suitable for you. There are three types of reloading presses namely single stage, turret, and progressive presses. I highly recommend you start off with a single stage reloading press. A single stage press is comparatively cheaper than the other two types. It is important to watch your budget as there will be other accessories to buy besides the reloading press. Is easier to set up and use. It doesn’t have a complicated learning curve as the others. Allows you to use a single die and load one case at a time. This will give you good reloading practice, skills, and knowledge as you progress to more complicated presses. However, keep in mind that the single stage press takes more time to adjust the dies every time you change them. It also has a lower rounds production rate compared to other types of reloading presses but you will be getting high-quality ammo with more accurate precision. As a beginner, the most important thing to consider will be ease of use and your budget of course. The Lee Precision Breech Lock Challenger Press comes in an attractive red color. It is an O frame reloading press with the strongest design. Its large opening gives you maximum clearance. It has an extremely easy priming process too. It uses a Breech Lock Quick system which allows you to change dies immediately without having to regulate the die each time you want to switch dies. O frame design. The O shaped frame provides plenty of room to work on while maximizing working space for different calibers. Perfect powder measure. This helps you to reload more accurately and assemble safer ammo. Safety primer feed. This feeds new primers to the primer arm automatically. You don’t have to manually do it as you would with other single presses. Easy to use. It is a highly recommended, easy to use single stage reloading press for beginners. I highly recommend the Lee Precision Breech Lock Challenger Press to beginners for several reasons. First and foremost, it is well built and has good looks too in its red color. It is well made using heavy-duty materials. Secondly, it is quite affordable compared to other presses with similar features. In terms of functionality, the press provides reliably accurate ammo. Its priming arms are designed for both small and large primers. The arm can be adjusted on either side of the press. You can even adjust its length. It is a good basic reloading press that is easy to set up and use also is built to last long too. The amount of ammo you require in a day will determine the type and production rate of the reloading press you choose to invest in. Different types of presses have different output per hour rates. Find one that meets your daily ammo requirement. Take time to check the press capability in terms of output per hour rate and find one that suits your reloading goals. Some presses can load both handguns and rifles while others can only load either a rifle or handgun. Look for a press that can load the type of weapon or weapons you own. It is important to consider the volume and accuracy of the presses too. The level of accuracy and amount of volume you need in a press will dictate whether to go for a single stage or progressive reloading press. Quality is a key factor to consider in anything you plan to purchase, including reloading presses. There are numerous reloading press brands and products on the market today. You may want to choose a high-quality press but keep in mind that it will come with a higher price tag. If you are a beginner in reloading, you may choose to go for a single stage press to get you started rather than spend a lot more on a progressive press with features you’ll neither use nor understand when starting out. However, whichever brand or type of reloading press you choose, make sure it has a solid, heavy-duty build. Go for a durable machine that will serve you for many years to come. The best reloading presses have a solid and durable cast iron frame. Another important factor to consider when looking for a good press is your reloading speed. For instance, if you are a casual shooter who only wants a few hundred rounds for monthly trips to the shooting range, then a single stage or turret press will do. If you are a high volume shooter who practices regularly for competitions, you may require thousands of rounds each month. In this case, go for a progressive reloading press that can accommodate your huge ammo needs. A single stage press will be more than sufficient for beginners with a low demand for ammo. Most single stage presses have a production speed of 100 rounds per hour but provide excellent high precision ammo. They are slow but sure in the way they work. A turret press will load rounds faster than a single stage press. This is because it does not require changing dies and shell casings constantly. The turret press has a good production speed for a beginner with a higher volume demand for ammo. The progressive press is the perfect option for the advanced reloader with a huge demand for ammo. There are progressive reloading presses that can produce more than a thousand rounds per hour. The amount of ammo you need will determine how fast you want them produced and the type of press to invest in. You may also need to consider prime and priming solutions when purchasing a reloading press. The prime or priming solution can be bought separately if it doesn’t come with the press. However, it is advised to buy a machine that includes a prime or priming solution. Does the best beginner reloading kit come with the necessary accessories? Check if the kit has everything you need to start reloading. There are many all-in-one best single stage reloading press kits that include all the necessary accessories to get you started immediately. Some even include useful tools to make the reloading process easier for you. Important accessories to consider include powder measures, powder scale, case prep tools, primer feeders, and mounting hardware just to mention a few. Make sure the accessories included in the reloading kit match your needs. Q. Is it cheaper to buy a complete reloading press kit? A. Buying a complete reloading press kit is in most cases the best option since you’ll get most, if not all, of the accessories and tools you need to get started right away. The tools and accessories are best and cheaper when brought together in a single kit. Q. Why are reloading dies not included in most presses? A. Many reloading press products do not include dies in the package. The main reason is that most reloading presses work with different calibers while dies are designed for specific machines. If you buy a particular reloading press, you’ll also need to buy a set of dies for the calibers you want to load. Q. Must you only use the recommended prime brands in a reloading press? A. Absolutely yes. It is important to ensure that you only use the recommended primer brand. Failure to do so could potentially result in accidents or explosions when firing. Be safe and use the correct primer. Q. Why is it important to always lube the case? A. It is important to always lube the case. This is because the lube makes it possible for the case you are working on to settle in the die and form evenly. If you don’t lube the rifle case properly, it may get stuck with the die. Some pistol cases, however, don’t require to be lubed when you use a carbide sizing die. Q. What can I do if I can’t find bullet weights in the manual provided? A. If the bullet weight you wish to reload is not included in the reloading press manual, you may have to use loads recommended for heavier bullet weight. There are many advantages of reloading your own ammo. Compared to buying ammunition at the gun store, reloading is actually much cheaper in the long run. Once you are done with the initial purchase of the reloading press, the rest of the accessories will be cheaply available. If you are a heavy consumer of ammo, the wisest and most money-saving thing to do is to invest in a good progressive reloading press. Reloading your own ammo has another advantage in terms of performance. Factory made ammo is perfectly okay to use but you cannot rely on it to measure the performance of your handgun or rifle. With your own homemade bullets, you can accurately measure and improve the performance of your gun. This is why most sharpshooters prefer to load their rifles. It is also a good thing to have a good idea of the quality of ammo you use. You can hardly tell the quality of bullets bought from the gun store but when you reload your own, you know exactly how each bullet was made. Reloading gives you full control over the entire process from priming to crimping. You have the ability to choose your preferred ingredients, parts, and tools in the entire process. As a reloader, you know how much powder measure went into each bullet. So how do you find the best reloading press that suits your needs? This will depend on the amount of ammo you intend to produce, budget, and your expertise level. If you are a beginner in reloading with a low volume demand for ammo, a single stage press or a turret press will work for you. If you an avid shooter with a high demand for ammo, and with a bigger budget, then definitely go for a progressive reloading press. All the reloading press kits and products we have covered in this review are great options depending on your ammo needs and expertise. For beginners, I would recommend the Lee Precision Breech Lock Challenger Press. So go ahead and find the best reloading press from our list that matches your needs, expert level, and budget.